I’m fortunate enough to say that I have several return customers that order these hand painted popcorn bowls that keep me busy painting throughout the year. One is a wedding videographer out of Broken Arrow, Oklahoma (Pen Weddings). 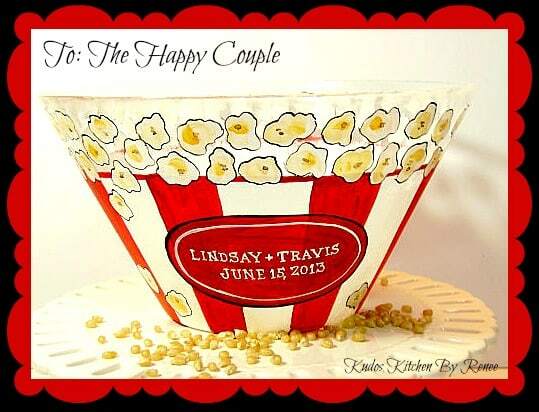 She orders these bowls from me for her wedding couples, and then uses the bowls when she returns the wedding video to her couples along with some added popcorn. I hear this gift idea has always been a huge hit with her couples, and I must say I’m thrilled to play a small part in all the happy occasions. A few of my other repeat customers for these bowls are a real estate agent from Colorado who likes to give them as his “thank you” and “housewarming” gifts for his clients after they’re successfully closed on their new homes. And I have several customers who work in different type of agencies who like to give my hand painted popcorn bowls as wedding gifts to their clientele through the year. 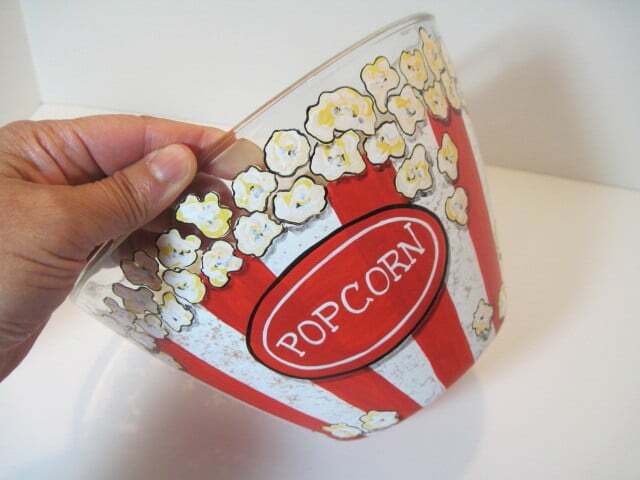 I think the thing that makes these hand painted popcorn bowls so special (other than the cute red and white popcorn theme) is that the bowls are completely personalized, adding more “pop” to an already adorable presentation. But, enough of all of that! Let’s get down to the business of turning a plain glass bowl into something memorable, shall we? Please click on the video below to see how I make my hand painted popcorn bowls in warp speed! 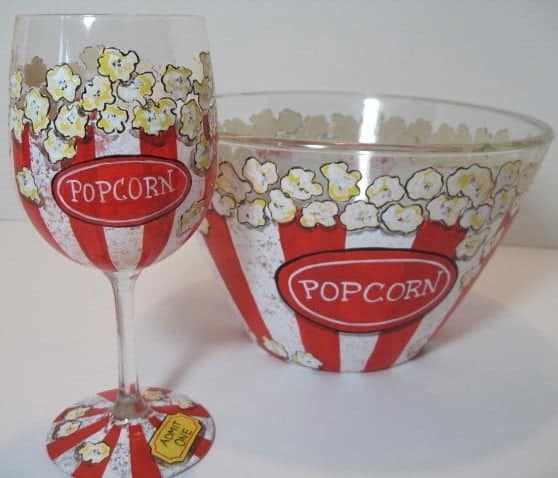 If there is ever a hand painted popcorn bowl (or wine glass) I can paint for you, or someone you know, please don’t hesitate to contact me directly, or visit my shop. Custom orders are always welcome and personalization is always free. All of my items are painted to order and unique with great attention to detail and loving care. Until we eat again, I hope you have a deliciously colorful day! Hello Renée, your bowl looks so nice! I wanna try one!